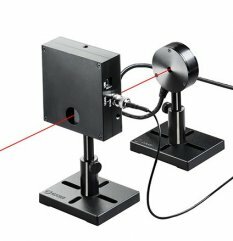 The RM9 radiometer system is a sensor and optical beam chopper combination for measuring the power of very low level CW or quasi CW light sources. The RM9 sensor has a pyroelectric element to measure a wide dynamic range of radiation, from <100nW to 100mW. It has an 8mm aperture and covers the spectral range from 0.15µm to 12µm. The system comes with the RMC1 chopper that is placed between the source and the RM9 sensor. Max Energy Density (for <100ns): N.A. Max Energy Density (for 2ms): N.A.